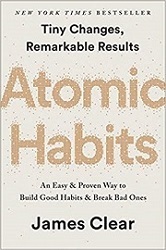 Eden read Atomic Habits: An Easy and Proven Way to Build Good Habits and Break Bad Ones by James Clear and thought about different strategies for building better habits. While I was home over Christmas holiday, my grandma insisted that everyone in my family start their morning the same way. Before she would let you drink a cup of coffee, she would make you drink a full glass of water in front of her. And since our kitchen is small and there’s only one path to the coffee, each of my siblings begrudgingly obliged. For ten days our behavior changed, and we were probably better off for it. But we all knew that as soon as my grandma went back to Louisville, we would go back to our old habits. I thought about this as I read Atomic Habits: An Easy and Proven Way to Build Good Habits and Break Bad Ones by James Clear. It’s easy to change your behavior when someone is standing over you, like a personal trainer, boss, coach, or parent. It’s almost like you don’t have a choice (and in the case with my grandma, I definitely didn’t). But how do you change your behavior when no one is watching or keeping you accountable? I think at one point I would have answered “lots of self-control.” Clear, however, says that “self-control is a short-term strategy.” He believes that managing your behavior is less a matter of self-control, and more a matter of understanding how your environment impacts your habit loop of cue, craving, response, and reward. I noticed that over the past several weeks I’ve been able to keep up good habits by simply focusing on one element of the habit loop: cue. A habit that I’ve been trying to implement since November is a light daily yoga practice. After reflecting on my desired behaviors and their cues, I realized that one reason I never remembered to do yoga was because I never saw my yoga mat. I used to keep my yoga mat in the back of my room where it was hidden by my dresser because it made my room look tidier. A few weeks ago I moved my yoga mat to the front of the room so that it’s the first thing I see when I get home from work. I’ve found that this cue alone has helped me do yoga 3-4 times a week instead of 1-2 times a week. When it comes to stopping bad habits, I've learned that it’s more helpful for me to focus on response rather than cue. This is because most of my undesired behaviors are cued by an emotion rather than an external factor. Take for example social media. I know that I tend to check social media when I feel bored or anxious. But being aware of this cue often is not enough to stop my response of reaching for my phone. That’s why I followed Clear’s advice of deleting social media apps during the week. (Clear even went so far as to have his assistant change his passwords.) Thankfully, for me, trying to click on an app that isn’t there is enough of a reminder to change my behavior. I appreciated Atomic Habits because Clear provides practical strategies for managing your habits at just the right level of technicality. One of my favorites lines from the book is, “You do not rise to the level of your goals. You fall to the level of your systems.” That’s why if I did want to continue drinking a glass of water before my coffee each morning, a better strategy (short of living with my grandparents) would be for me to leave a glass of water on my nightstand each night. Take a moment to think about any habit (good or bad) that you are currently trying to manage with self-control. How could you design your environment to help making (or breaking) this habit as easy as possible? I’d love to hear about your strategies for managing behavior in the comments.